Choose between a standard size single layer rectangular cake, double layer rectangular cake or round 3 layer cake.The cake comes in vanilla and is the most cost-effective option for any function. We can print a picture in any theme, whether it be for kids, adults or corporate. 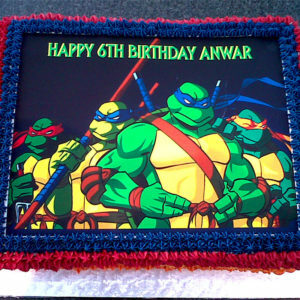 Or you can provide us with a picture of the person whose image you would like on the cake. Furthermore we can also include a message of your choice on the image. We sell the pictures on their own as well.